← Crazy, bonkers, mad, brilliant and brave! Angove Family Winemakers – one of South Australia’s oldest and most renowned wineries and winemaking families continues to impress the world, winning a haul of trophies at the 2012 International Wine Challenge in London for the 2006 Vineyard Select Clare Valley Riesling. It won: the Clare Valley Riesling trophy, the Australian Riesling trophy, the Australian White trophy and most impressive of all the International Riesling trophy for best riesling in the world. The story of the Angove Family Winemakers starts in 1886 when William Thomas Angove and his family arrived from Cornwall in south-west England (of Doc Martin fame today!) to start a new life. Being from neighbouring Devon myself I feel some affinity with this story as I also relocated to South Australia. William Angove, a medical doctor by profession (like Doc Martin! ), initially planted vines and made wine as a tonic for his patients. He planted vines in Tea Tree Gully, a few kilometres north-east of Adelaide. His son Thomas was a pioneer of winemaking in the Riverland, further north from the city, and the Renmark winery remains today. Urban sprawl saw the demise of the Tea Tree Gully vineyards in the 1970s. The family’s major vineyard holdings today are in McLaren Vale and Renmark, and impressive welcoming cellar doors are at both locations. The Angove Family Winemakers produce a wide range of wines, from shiraz to riesling and from grapes sourced from all over South Australia. Most recently released is the Angove flagship wine called The Medhyk, which in Cornish means ‘the doctor’, in a nod to the founder. First released in 2011, it is produced from old vine McLaren Vale shiraz and is at the higher quality end of the range. Being a lover of old rieslings I have shared this passion on my wine travels. Imagine my surprise and delight when a lovely English lady from the Renmark cellar door contacted me recently to say she had been inspired by my love for old rieslings and started trying more of them herself. She has found the exercise more than rewarding it seems and has sent me a bottle of the 2006 Vineyard Select Clare Valley Riesling to try! Of course I am biased because they are such a great company and wonderful staff when you visit the cellar door. Plus I am biased because it is an aged riesling from one the best riesling producing areas in the world. I shared this wine with a select group of tasters at Fassina in Somerton Park, south of Adelaide. Immediately striking is the colour – a deep luscious and brilliant golden yellow – the archetypal sunshine in a glass! The nose is generous with honeysuckle and a touch of sweet fruit with just a kiss of kerosene (that’s a good thing!) which is typical of aged rieslings. The palate is dry, oily and full bodied, giving honeysuckle cut through with lime and a light toastiness. It is long and rounded and soft with a a pleasant acid balance running through it. 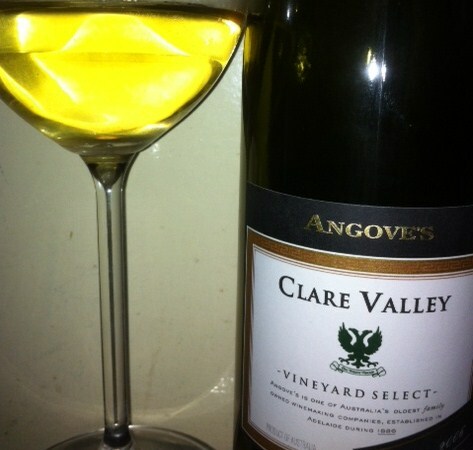 The consensus was that it is a great example of Clare riesling, pleasingly varietal and a bargain – if there was any more to be had! This entry was posted in McLaren Vale wine, New World wine, riesling, Riverland wine, South Australian wine, Syrah/Shiraz, Wine events, Wine news, Wine varietals and blends and tagged aged riesling, Angove, Australian wine, Clare Valley, riesling, Riverland, South Australian wine. Bookmark the permalink.